The exclusive Villa El Messidor, with its own swimming pool and air-conditioning, large garden and tropical plants is pleasantly situated next to the Puerto Banus, and in the 2nd line to the beach in the smart residential La Pepina/Azalea beach area. It is only 60m from the beach, and within a short walking distance to hotels, bars, restaurants, and a supermarket. Puerto Banus with its restaurants and nightlife is within 10/15 minutes walk and the pleasant, white washed Andalusian town of San Pedro is only within a 3 minute drive. Several golf courses lie minutes away by car. Large en-suite bathroom with extra shower to master bedroom. En-suite bathroom to one of the twin bedrooms. Further bathroom. Living room, large and comfortable with 2 seating areas with sofa and sofa beds as well as a fireplace. Dining room with seating for 10. The living room and dining room have double doors to the arched terrace overlooking the pool and garden. Large well equipped kitchen, with seating area, oven, fridge/freezer, microwave, dishwasher, washing machine, clothes dryer. Europe's sunniest ski resort, the Sol y Nieve in the Sierra Nevada, host of the 1996 'world Ski Championships' can be reached in 2 hours. Notes on accommodation: The villa has 350m2 building with a land/garden of 1000m2. It is equipped to accommodate 8/10 guests in 4 spacious bedrooms. Extra cots are also available. Pets not allowed. Outside: Large 'L' shaped, floodlit swimming pool, built-in barbecue, floodlit terraces and garden furniture. Cleaning / Towels / Linen / Maid service: Weekly linen change, maid service twice weekly and regular garden/pool maintenance are provided. 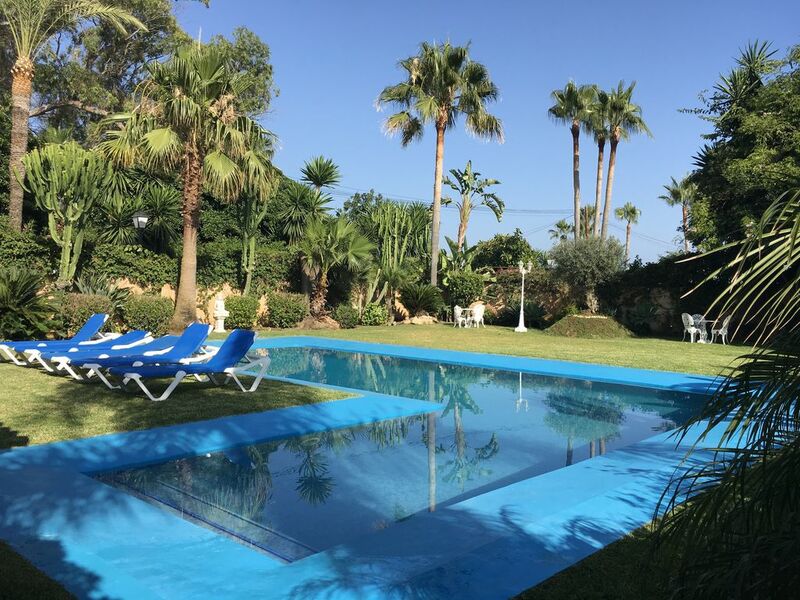 The villa is located within 5 minutes walk to CoCo Beach and Mistral (no stress) beach in Puerto Banus, and their respective recreation and sport facilities. The Kala-Kalua water sport facilities (with jet skiing, pedal boats, para-sailing, and banana boats) and San Pedro fine beaches and its palm planted promenade are within 5 minutes walk in another direction. 40 minutes to Malaga and Gibraltar airports. The 2 most well-known fish restaurants in the entire Marbella area (Nueve Reino and Alabardero), on the San Pedro promenade, are within a very short walking distance. There are numerous places of historical interest nearby. Granada with its Alhambra Palace and gardens, is approximately 1.5 hours drive. The old City of Ronda is within 45 minutes drive. Gibraltar is within 1 hour drive. The Costa del Sol is at the forefront of Europe for sailing with its excellent marinas and invaluable berthing capacities, these include Puerto Banus, Marbella, Estepona, Duguesa, etc. There are a number of tennis clubs as well as many excellent health and gym centres in the Marbella area. Puerto Banus: Since its inception some 40 years ago, this port has steadily grown and now features a casino, commercial shopping centre, aCorte Ingles department store, marine observatory and a multi cinema with films shown in their original soundtrack. Nightlife buzzes at Puerto Banus with your choice of alfresco bars, piano clubs and discos while during the day this is a shopper´s dream. Boat trips are available on a regular basis from the central promenade. This is the place to be pampered yacht side and ogle those fabulous luxury yachts. The setting is close to ideal, with its impressive mountain backdrop and ocean views. Marbella: What formerly was just a small Andalusian fishing-village turnedinto one of the most exciting holiday resorts along the Mediterranean coast,one of the favourite places of the rich and beautiful and all those who would like to be. This centre of the jet-set and show business, offers beautiful boulevards, parks and gardens, as well as those romantic narrow lanes in the best Moorish or Andalusian tradition that make Marbella's unmistakable personality. With its great beaches, great climate, and a unique offer in sports, gastronomy and entertainment ... a visit to Marbella is a guarantee for unforgettable exclusive holidays.